After a quick “Topeka Search” aka Google search, I found that this drain problem could be fixed by removing the front panel of the washing machine and cleaning out a small container found behind the panel. Imagine my surprise to find a sock, some change and a hand full of Airsoft BB’s in this container. It was a pretty easy fix but I’m not sure why it was designed to allow items as big as a quarter to be washed down the drain and into this container. 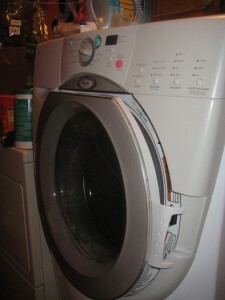 I ask myself again, why didnt’ I just stick with an old school washer and dryer? Those things run forever and are super low maintenance.